As a business owner, you want to utilize every advantage available to maximize your success. And one of the ways you can do that is by full understanding– and making a smart choice about– IRS tax year guidelines. As most are already familiar with personal taxes by the time they start a business, one of the two tax filing methods is already quite familiar– calendar year. However, when first starting out, many business owners aren’t aware of what fiscal year is and how it works. So, let’s dig into it and help you make the smartest choice for your business. The simplest and most straightforward, the calendar year method is the most familiar because the schedule is exactly the same as your personal tax filing schedule: beginning on January 1st and ending December 31st of that year. This method is generally much easier to work with for most businesses as it allows you to file your business and personal taxes all at once, making it far more convenient. However, for some business types, fiscal year can be more beneficial. So, what is a fiscal year? A fiscal tax year is a 12-month period, just the same as with the calendar year method. However, you choose the start date with the fiscal method, with that tax filing period ending exactly 12 months later. So, for example, let’s say you’re products are Summer-oriented so that’s your busy season. For that reason, you want your tax year to end just after your busy season, a common practice. If you pick to have your fiscal year begin on October 1st it would then end on September 31st. This can give some businesses added flexibility and convenience as compared to the traditional calendar year method. How is my filing schedule decided? But if that’s the case, how exactly is your filing schedule decided? As a business owner, you choose a tax filing schedule when you file your business’ first official tax return. Also, keep in mind that if you’re an S corporation, you’re required to use the calendar year method one way or another, either by using the calendar year method itself or a fiscal year ending on December 31st. Am I on a fiscal year or calendar tax year? Once your business tax reporting method is chosen, you’re required by the IRS to continue filing your taxes using that schedule. For that reason, if you’ve already filed a business tax return, you’re probably already using a calendar year method and have to continue to pay taxes based on that filing schedule. Having mentioned all that, and assuming you’ve already filed your first year’s taxes, the question that’s probably on your mind is: am I on a fiscal or calendar tax year? Near the top of your tax return you’ll see a line just below the form title (highlighted in red here) which states your filing method. If you’ve not filled out the “or tax year beginning _____, 20XX, ending ________”, the IRS will default you to calendar year. 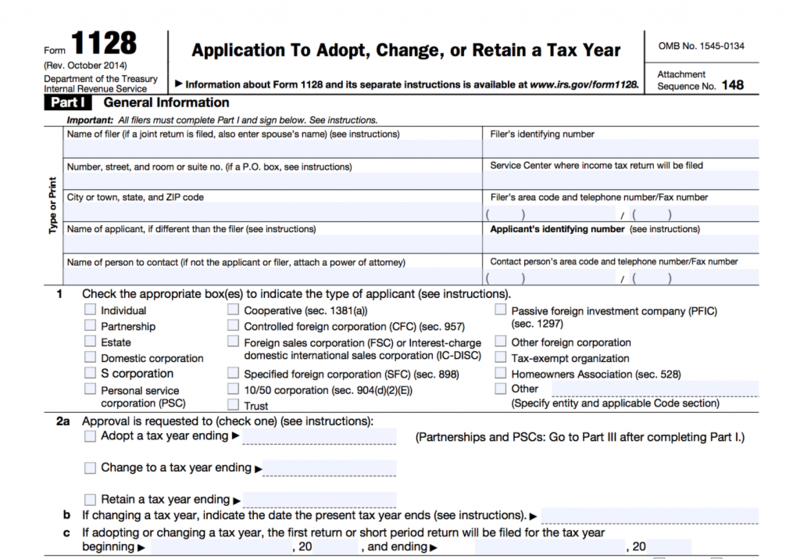 How do I change my tax schedule? Once you’ve filed your taxes using one of the above two methods, you’re locked in and must continue using that filing method. Keep in mind that a user fee might be required. However, you may qualify for automatic approval, in which case a fee won’t be required. See instructions located on Form 1128 for more information. What should my fiscal year date be? So, what if you have a highly seasonal business (or some other factor) and decide that you want to file using a fiscal year– what should your fiscal year dates be? 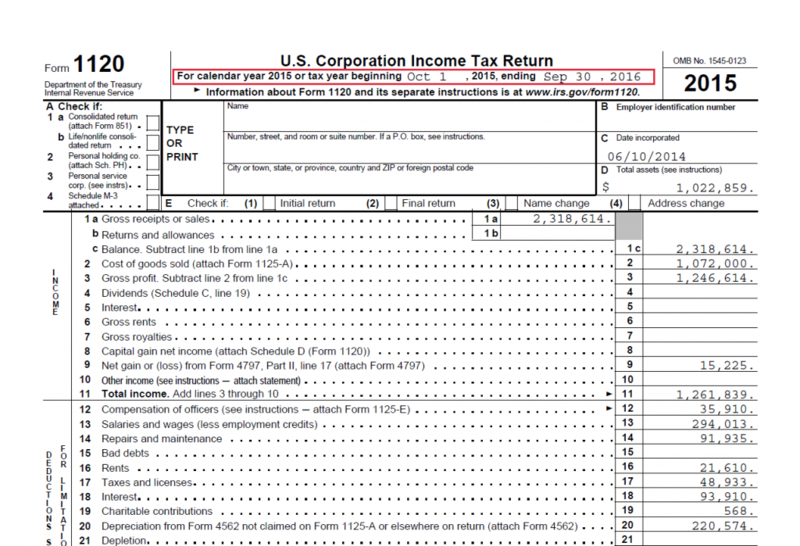 The type of business: There isn’t much here except that if you’re a sole proprietor, you’re required to use a Dec. 31st year-end date to match the personal tax year end. Your business cycle: This is when seasonality comes into play. If you’re business is any other entity than a sole proprietorship, you can choose any quarter to be your fiscal year end. Often, businesses select this based on the closest quarter end to the end of their busy season. For example, if you’re a Halloween or Christmas-oriented company, you’ll probably choose December 31st or January 30th as your year-end, whereas if you’re a swimwear company you might pick September 30th. Ultimately, it’s to you whether you choose a calendar or fiscal year schedule. Many businesses will find calendar year far more convenient as you can file your business and personal taxes both at the same time. That saves time and, often, can save you money as well. However, take the time to consider what is best for you might actually be better suited for a fiscal year schedule, allowing you to close out the year just after your busy season and more effectively navigate tax payments in a smart way. The choice is yours– choose wisely.